Bring your playing to a new level with our ultimate selection of Badminton nets designed and built for both recreational and competitive play. This 12-ply nylon net is made of ¾" square mesh, and features a 1.5" headband with a nylon rope cable. 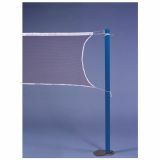 Bring your playing to a new level with our selection of Badminton nets. 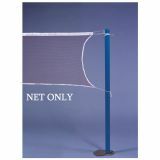 Our nets are designed and built for recreational and competitive play. This 18-ply nylon net is made of ¾" square mesh, and features a 1.5" headband with a nylon rope cable. Bring your playing to a new level with our selection of nets designed and built for recreational and competitive play. This 18-ply nylon net is made of ¾" square mesh, and features a 2" headband, side and bottom tape, and a nylon rope cable. Bring your playing to a new level with our selection of nets designed and built for recreational and competitive play. 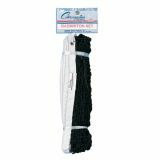 This 18-ply nylon net is made of ¾" square mesh, and features a 2" headband, side and bottom tape, and nylon coated steel cable. 2-3/8" O.D. steel uprights designed for High School, Intramural and Recreational Competition. Fixed net height. Sleeves and net sold separately. Portable instant badminton match for 4 players; sets up on any surface in seconds. Lightweight, freestanding base design, includes 2 red, 2 green rackets, 2 shuttlecocks, regulation net and lightweight carrying case. 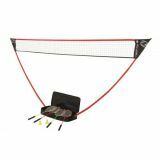 Set up your next badminton tournament in a flash with this Champion Sports Deluxe Badminton Tournament Set. Designed to last, the durable 3-piece black powder coated 1.5" diameter powder-coated aluminum poles are strong enough to endure even the most intense smashes and the high quality 1.2" nylon mesh net features waterproof tarpaulin tapes to help it stand up to the elements outdoors. Includes four durable aluminum rackets and both game and practice-quality shuttlecocks. 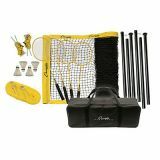 The whole set also packs away neatly into a weather-resistant carrying case for easy transportation and storage.